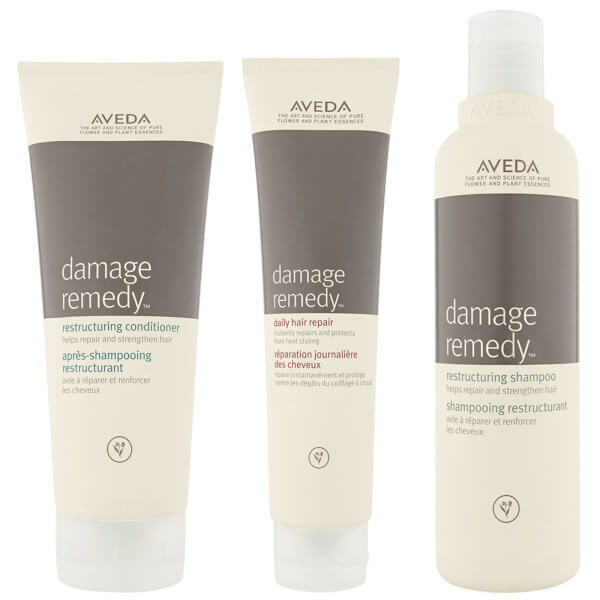 Treat your locks to the Aveda Damage Remedy Trio; a shampoo, conditioner and hair treatment that work in tandem to restore sleek, healthy-looking tresses. 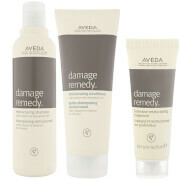 Ideal for dry, damaged hair in need of repair. Suitable for hair that has been weakened by chemical processes, heat styling and environmental exposure, the lightweight shampoo helps to restore healthy-looking locks from root to tip. Formulated with Babassu, Coconut and Quinoa Protein, it works to strengthen and repair hair from the inside out. Ideal for dry, damaged and chemically treated hair that needs TLC to help repair and restore. Powered by organic plant-based emollients, the detangling conditioner helps to repair and strengthen damaged hair, whilst infusing it with healthy movement, silkiness and shine. 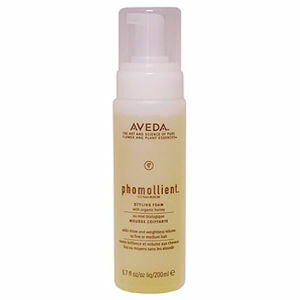 A leave-in treatment that helps to protect from heat styling. Infused with Quinoa and Wheat Proteins, the restorative formula penetrates deeply into hair to repair, strengthen and prevent further damage caused by blow-drying and straightening. Imparts a luxurious Bergamot, Mandarin and Ylang-Ylang aroma. Conditioner: Use as part of a daily ritual, following shampoo. Hair Repair: Work a small amount of product in hands, apply through damp hair and comb to distribute. Do not rinse out. Shampoo: Aqueous (Water\Aqua\Eau) Extracts\Extraits Aqueux:Medicago Sativa (Alfalfa) Leaf Extract, Linum Usitatissimum (Linseed) Seed Extract, Sodium Methyl Cocoyl Taurate, Babassuamidopropyl Betaine, Sodium Chloride, Disodium Coco-Glucoside Citrate, Dimethicone, Glyceryl Oleate, Coco-Glucoside, Hydrogenated Lecithin, Hippophae Rhamnoides Oil, Olea Europaea (Olive) Fruit Oil, Hordeum Distichon (Barley) Extract\Extrait D'Orge A Deux Rangs, Chenopodium Quinoa Seed Extract, Phellodendron Amurense Bark Extract, Dehydroxanthan Gum, Stearic Acid, Potassium Stearate, Polyquaternium-10, Laureth-4, Laureth-23, Glycerin, Sodium Gluconate, Citric Acid, Fragrance (Parfum), Linalool, Geraniol, Citronellol, Limonene, Potassium Sorbate, Benzoic Acid, Methylisothiazolinone, Methylchloroisothiazolinone, Annatto (CI 75120). Conditioner: Aqueous (Water\Aqua\Eau) Extracts\Extraits Aqueux:Medicago Sativa (Alfalfa) Leaf Powder, Linum Usitatissimum (Flaxseed) Seed Extract, Cetyl Alcohol, Cetearyl Alcohol, Glycerin, Dimethicone, Stearalkonium Chloride, Behentrimonium Chloride, Hordeum Distichon (Barley) Extract\Extrait D'Orge A Deux Rangs, Chenopodium Quinoa Seed Extract, Phellodendron Amurense Bark Extract, Hippophae Rhamnoides Oil, Fusanus Spicatus Wood Oil, Tocopherol, Hydroxyethylcellulose, Squalane, Helianthus Annuus (Sunflower) Seed Oil, Coco-Caprylate/Caprate, Alcohol Denat., Sodium Gluconate, Fragrance (Parfum), Linalool, Geraniol, Citronellol, Limonene, Phenoxyethanol. Hair Repair: Aqueous (Water\Aqua\Eau) Extracts\Extraits Aqueux:Hippophae Rhamnoides Extract, Linum Usitatissimum (Flaxseed) Seed Extract, Medicago Sativa (Alfalfa) Leaf Powder, Cetearyl Alcohol, Glycerin, Chenopodium Quinoa Seed, Methyl Soyate, Ethyl Macadamiate, Hydrolyzed Wheat Protein PG-Propyl Silanetriol, Distearyldimonium Chloride, Behentrimonium Methosulfate, Cetrimonium Chloride, Hordeum Distichon (Barley) Extract\Extrait D'Orge A Deux Rangs, Phellodendron Amurense Bark Extract, Hippophae Rhamnoides Oil, Helianthus Annuus (Sunflower) Seed Oil, Fusanus Spicatus Wood Oil, Tocopherol, Squalane, Alcohol, Dimethicone, Dimethiconol, Citric Acid, Fragrance (Parfum), Farnesol, Linalool, Benzyl Salicylate, Citronellol, Citral, Limonene, Benzyl Benzoate, Geraniol, Phenoxyethanol, Potassium Sorbate.